September 30th, 1791 – Wolfgang Amadeus Mozart (AKA Johannes Chrysostomus Wolfgangus Theophilus Mozart, AKA Moatsy, AKA Golfwangus, AKA Wuss in Boots) conducted the first performance of The Magic Flute at Freihaus-Theater auf der Wieden in Vienna, Austria. This would be the last opera by Mozart to make its debut, as he died about two months later. Receives the Order of the Golden Spur from Pope Clement. Meets Haydn who praises him as "the greatest living composer"
Meets Paul McCartney and challenges him to a "bass off"
So as you can see, Mozart wins. 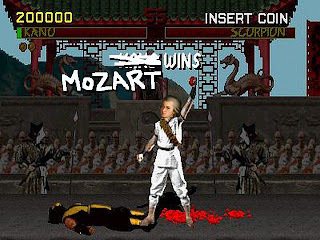 That jerk Mozart always wins! I'll catch up to him someday! 1. I'm still alive. Mozart can't say that! 2. I can play drums. Mozart probably never learned to "pound the skins"! 3. Modern medicine. Mozart could have used it! 4. Google.com Mozart would've had to use this. 5. Mozart was probably a total wuss. He is one of the most revered composers of the Classical era, but I doubt he could hold his own in a no-holds-barred street fight. Although I've never been in an actual street fight, I've seen way more movies about fighting than Mozart ever has. I bet I could use the crane move from the end of Karate Kid on him and he wouldn't know what hit him...he's THAT FAR behind the times! Next time I'm going to compare Mozart's life to that of Alex Masi (pictured to the right). I don't want to spoil it for you, but Mr. Masi has a few tricks up his leather sleeve. He has a trick on his chest as well. And either the time after that or three times from now, I'm going to compare my life to Strawberry Shortcake's life and share a recipe for vegan strawberry shortcake that will make you want to vomit in ecstasy. 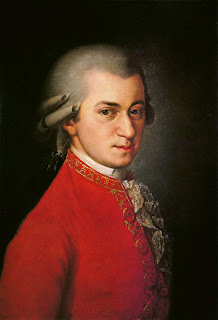 Mozart also had more hair...but his was lame so I believe you win that one. I can't even tell how hard I'm laughing. You are amazing! You forgot that Mozart was poor as a rat and had really no money and he drank like an alchoholic, so you take these ones too. you're back and just as hilarious as ever! Technically Salzburg wasn't annexed to Austria until after Mozart's death, so we'll just leave it as "Salzburg" for now. Cool? so, that vegan strawberry shortcake recipe, can you make it vegan AND gluten free? not to be greedy, but a girls gotta vomit in ecstasy, ya know? 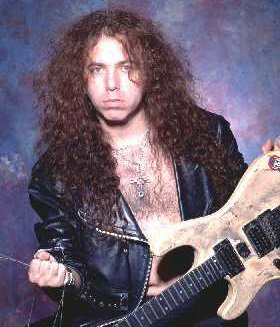 also, 24 hour party zone is my influential song to get my bum outta bed, and mozart's music makes me wanna keep my bum in bed! so, point you, not mozart. Is there anywhere that you're selling the song 'Who's Gonna Love U Now?" Your website says it's down, I can't find it on Amazon (though I did get your album from there, which this song wasn't a part of). I feel like I really need that song. Like, I don't think you understand how badly I need that song. You have provide nice discussion about the difference between Mozart/Hunter. I really like it. This is just awesome. Nowadays, it can be hard for parents to spend time with their children especially if they work full time jobs ad have more than one child. There are times when it can be hard to spend time and connect with your children, and that is where these tips can come in handy to help you. This was actually an attention-grabbing subject, I am very fortunate to have the ability to come to your blog and I will bookmark this web page in order that I could come again another time. Great Post, admired it will be cat-and-mouse for your abutting posts,the internet would be a abounding bigger place. Charm accrue it up! Lead off level no less than five, in each level you could make three statistic factors and you could go to spread them like this: 1vitality and 2strength.